What happens when poetry takes over your life? Ryan O'Brian finds out when he spouts poetry and writes poems all day long! I beg you, won’t you help me? Please help me, be a friend. this poem will not end! covered with . . . haiku! 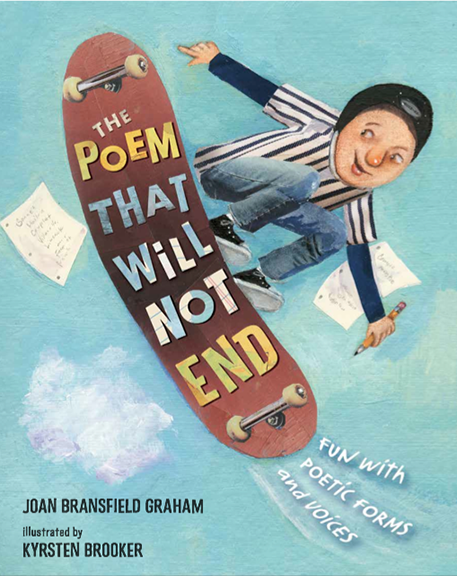 THE POEM THAT WILL NOT END: FUN WITH POETIC FORMS AND VOICES, written by Joan Bransfield Graham and illustrated by Krysten Brooker, is a fun-filled romp through the day in the life of a young boy who gets caught up in poetry. While the rhyming text of the story keeps readers moving forward, it's the poems written in the illustrations that make you stop to soak in all the poetry goodness. You’ll find a villanelle, sonnet, acrostic, haiku, limerick, and many more forms. This triolet describes just how caught up Ryan is in writing poetry. to free me from this urgent need to write? |t follows me and hounds me night and day. to toss aside this curse—| want to play! You must admit . . . this is a scary sight. All poems ©Joan Bransfield Graham. All rights reserved. While reading this book I found myself thinking back to MATH CURSE, written by Jon Scieszka and illustrated by Lane Smith. In it, readers follow a nameless student who lives a day filled with math problems. This book is different in that Graham has given readers a boy with a name, a family, and an ordinary life filled with poetry. Kids will love the story, while teachers will love the fun poems and poetic forms that are introduced. Reading this had me wanting to ask folks around me, "how do you use poetry in your own life?" I think that’s a great question to put to the very talented author of this book. Here are her thoughts about that and some more on her poetry writing process. How have you used poetry in your own life? Joan: I make my own cards with my original photos and poems. Isn't poetry what we reach for in life's most important, emotional moments? But I think poetry is how you see the world. It expands our vision, helps us see higher, wider, deeper . . . longer. It captures a moment in time. Sometimes life can take over your poetry. I found if I didn't make poetry an important part of my life, I wasn't the person I was meant to be. It can be a continuing challenge to fit everything in . . . a juggling act. While POEM is written in a humorous vein to let children see that poetry is FUN, I hope it also makes some small statement that we must embrace our creativity, our uniqueness, and weave it into our lives; we are all richer for it. Ryan O'Brian, in the end, does "make it work." I love how poetry connects us to ourselves, to each other, to the world. We have such a vibrant poetry community! Here's to celebrating each other's imagination, sharing a healthy, joyful creative "Fever," and staying connected. When was the main text/poem of the book composed? How did it start? Joan: Many years ago, and "It started with a rhythm,/ a rhythm and a rhyme." and I couldn't stop--I kept adding more ideas. The line "My mom called up, "Are you in bed?" is directly from my life. I was a "night owl" even as a child and was probably reading a book or writing poetry as late as I could. I never wrote on the mirror with toothpaste though. Did you share your drafts of the poems before you finished the book? Is there an individual or a group of individuals with whom you regularly share work? Joan: Yes, I did. When I first moved to California, I met some wonderful poets (They were writing for adults. ), and they are still dear friends. I'm in a terrific, helpful critique group of fellow SCBWI writers (I'm the only poet. ), and we meet at my home once a month. I'm also a founding member of the Children's Authors Network (CAN!) --a marvelous group of authors and illustrators, which includes poetry dynamos Janet Wong and April Halprin Wayland (also with Teaching Authors). If you click here, and then again on "Classroom Resources," http://canetwork.weebly.com/joan-bransfield-graham.html, you'll find my Teacher Ideas, across the curriculum, for POEM and other useful guides. As Co-coordinator of Ventura County for our SCBWI Central-Coastal California region, I help to plan a variety of events throughout the year for writers and artists in our area. How long do you let your poems “sit” before you let them go? Do you finish poems or abandon them? Joan: As long as they need. Rather than "abandon" poems, I think of them as being in various stages of incubation. It does help to let a poem "cool" for a few days and then look at it anew with "fresh eyes." Do you have a favorite poem from the book? Or a poem that you loved that didn’t make it into the final manuscript? Joan: I'm fond of "Bike," the poem from yesterday's prompt. Couldn't "Bike" be a metaphor for poetry? When you "step on," you are in for a ride that can "take you anywhere." I hope "the road ahead" is filled with poetry for all your readers. Tricia, you are doing an incredible job of seeing to that for both the fans of your blog and your students! Joan: So many things! Lee Bennett Hopkins has a new book, MANGER, scheduled for Sept., 2014, and I am fortunate to have a "Rooster" poem included--in fact, I see my rooster is on the cover! I have many other poems in forthcoming anthologies. When a friend whose son teaches high school English mentioned his students wondered why they needed to study poetry, I started writing an article--FIVE REASONS TO GIVE CHILDREN THE GIFT OF POETRY. I'm not sure where I'll send that piece when it's finished, but I need to write it. I guess I'm Ryan O'Brian. I had the pleasure of interviewing Joan nearly 5 years ago for a National Poetry Month series. You can read more about her and her poetry at Poetry Makers - Joan Bransfield Graham. THE POEM THAT WILL NOT END is a welcome addition to the world of children's poetry. I do hope you get a chance to enjoy it. So now for the fun! If you'd like to win a copy of THE POEM THAT WILL NOT END, please enter below. A winner will be chosen on February 5th. The form for this week's stretch is climbing rhyme. On this day in which we honor and remember Dr. Martin Luther King, Jr., I am pleased to share this poem by J. Patrick Lewis. The speakers say their piece. And still to come: The Word. And in his pocket pain. The Reverend takes the stage. Abe Lincoln turns the page. 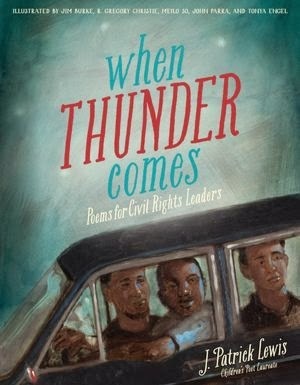 If you are interested in more poems on civil rights heroes, check out When Thunder Comes: Poems for Civil Rights Leaders by J. Patrick Lewis. It includes an introductory sonnet and seventeen poems about both women and men who stood up against injustice of every kind. This is how the book begins. The civil righteous are finished being meek. And know a million bells can drown out fear. Discolored and discredited our times. You can learn even more about this book in the Chronicle Books Blog post U.S. Children’s Poet Laureate J. Patrick Lewis Writes about Rights. 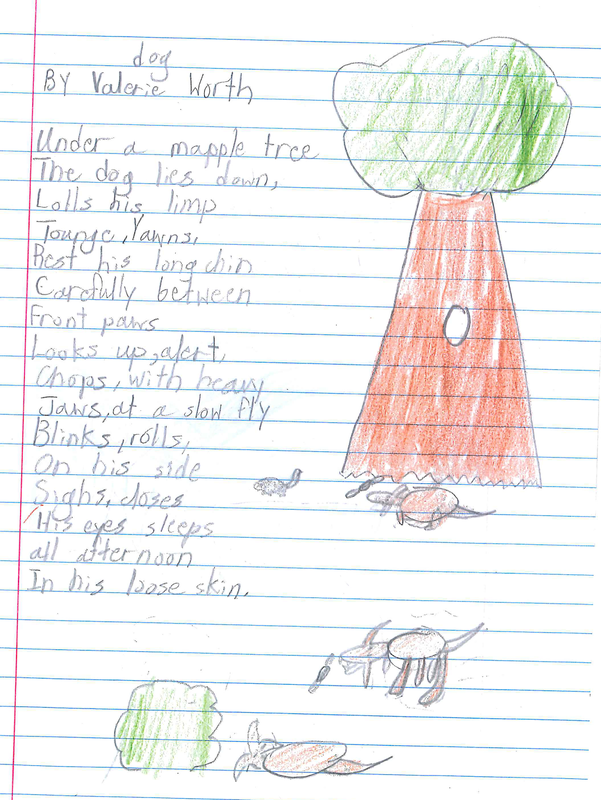 When William was in third grade (spring 2010) his teacher had the class copy and illustrate poems that "spoke" to them in their journals. This poem by Valerie Worth was one of his choices. As I flipped through the journal this poem came from I found a short entry on the word brave. Here's a portion of what he wrote. "My dog is brave during a short thunder storm. My dog is brave guarding her cookie." As some of you may know, we lost our brave girl this week. Just two weeks after being diagnosed with cancer her quality of life began to diminish much more rapidly than any of us expected. I came home from class on Monday night and we made the decision to have her put to sleep the next morning. Though she was with us for 16 years, it felt like our time together was too short and that the end came much too quickly. We weren't ready to let her go, but it was undoubtedly the right thing to do. The house is unimaginably quiet now, and I wince each morning as the urge to call her works its way up in my throat and I realize she isn't there to hear me. I've spent the last few days thinking of all the milestones she shared with us, including welcoming William to the family, an event that she wasn't particularly happy about! I am grateful to Amy Ludwig VanDerwater for sharing a poem with me earlier this week that really resonated. That is the poem I'm sharing today. Sometimes I think I'm crazy for feeling so lost over the death of a dog, but then I remember that I'm not the only one to feel the loss of a devoted companion so keenly. 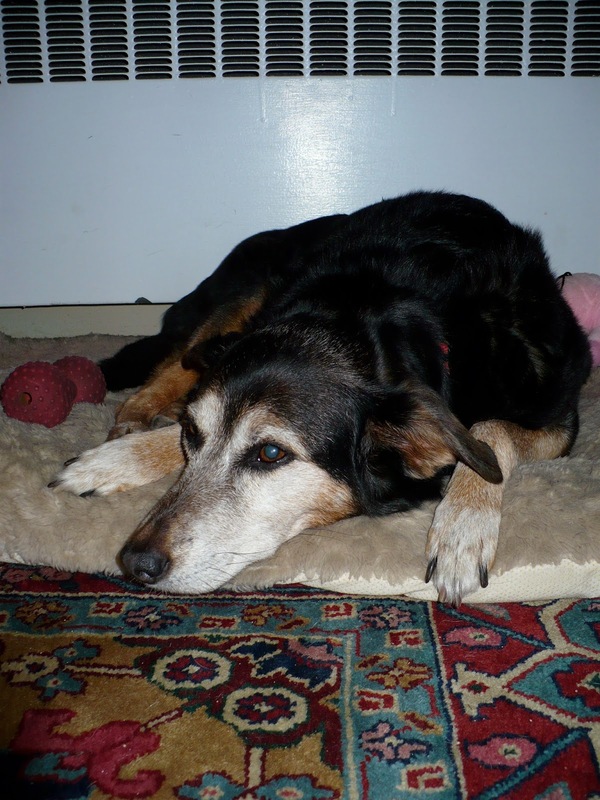 If you haven't seen this little piece by Jimmy Stewart, take a few minutes to watch him read a poem about his dog Beau. Before I wrap up I have one more poem to share. Thanks for sticking with me through this long post. Do check out all the wonderful poetic things being shared and collected today by Keri at Keri Recommends. Happy poetry Friday friends. This week's stretch is a real S-T-R-E-T-C-H. The form I have decided to tackle is the pantoum. I have read a great deal about this form and found many variations. I am not going to try and do this one in rhyme, though you can if you want to attempt it. Are you ready? Here's the form. The pantoum is a poem made up of stanzas of four lines where lines 2 and 4 of each stanza are repeated as lines 1 and three of the next stanza. The final stanza of a pantoum has an interesting twist. Lines 2 and 4 are the same as the 3rd and 1st of the first stanza, thereby using every line in the poem twice. Here is an outline for a pantoum with 4 stanzas. A fine example of a pantoum is this one by Randall Mann. It has 6 stanzas. it will not declare itself. men who fall in love with men. deserve something a bit more formal. I hope you'll join me this week in writing a pantoum. Please share a link to your poem or the poem itself in the comments. When William was young and I told him I loved him, he would ask "How much?" The replies began with "More than ..." and included phrases such as: all the tea in China, all the stars in the sky, and all the fish in ocean. After a while it became a game for us to see if we could come up with a new saying that represented something huge. When I stumbled upon this poem by Carl Sandburg, I was reminded of this. William's almost 13 now, so he doesn't ask "How much?" very often anymore. And tomorrow maybe only half a bushel? Tomorrow maybe not even a half a bushel. You can listen to Sandubrg read this poem at The Poetry Foundation. Check out other poetic things being shared and collected today by Donna at Mainely Write. Happy Poetry Friday all! Happy new year! After a short break for the holidays, the Monday Poetry Stretch is back and ready to take on another form. The trimeric is a form that was invented by Dr. Charles A. Stone. Here's how he describes it. Trimeric \tri-(meh)-rik\ n: a four stanza poem in which the first stanza has four lines and the last three stanzas have three lines each, with the first line of each repeating the respective line of the first stanza. The sequence of lines, then, is abcd, b - -, c - -, d - -. At first I thought this would be relatively easy because the first lines of stanzas 2, 3 and 4 are already written (seeing as how they use lines 2, 3 and 4 of the first stanza). Boy, was I wrong! That first four line stanza is so important! The lines must hang together, but they must also be able to stand on their own as introductions to the other stanzas. There are many examples on Dr. Stone's trimerics page. Here is one of my favorites. from the innocent boy next door. back to me, but she forgot to sign it. I cried because I had forgotten to add I love you. I hope you'll join me this week in writing a trimeric. Please share a link to your poem or the poem itself in the comments.